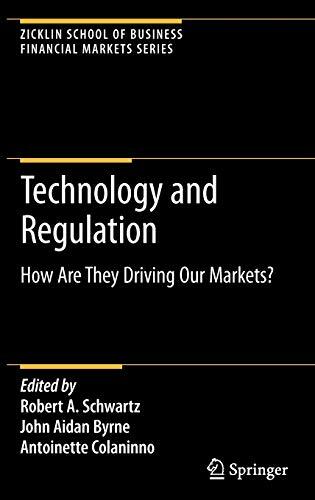 This book is an augmented account of Technology and Regulation: How Are They Driving Our Markets?, a conference hosted by the Zicklin School of Business at Baruch College on May 1, 2007. The text includes the edited transcript of the full conference: four panels and the major presentations of three distinguished industry leaders - Ian Domowitz, Managing Director, ITG, Inc.; Erik Sirri, Director of the Division of Market Regulation, US Securities and Exchange Commission; and John Thain, who was CEO of NYSE Euronext at the time of the conference. The book also includes a related paper by Paul Davis, Mike Pagano, and myself: "Divergent Expectations," Journal of Portfolio Management, Fall 2007. My co-editors and I have worked diligently to make this book, like all the other popular books in the series, more than an historical record. John Byrne, Antoinette Colaninno and I have edited the manuscript heavily for clarity and unity of ideas. Robert A. Schwartz is Marvin M. Speiser Professor of Finance and University Distinguished Professor in the Zicklin School of Business, Baruch College, CUNY. Before joining the Baruch faculty in 1997, he was Professor of Finance and Economics and Yamaichi Faculty Fellow at New York University's Leonard N. Stern School of Business, where he had been a member of the faculty since 1965. Professor Schwartz received his Ph.D. in Economics from Columbia University. His research is in the area of financial economics, with a primary focus on the structure of securities markets. He has published over 50 refereed journal articles and fifteen books, including The Equity Trader Course (co-authored with Reto Francioni and Bruce Weber) Wiley & Sons, 2006, Equity Markets in Action: The Fundamentals of Liquidity, Market Structure and Trading (co-authored with Reto Francioni) Wiley & Sons, 2004, and Reshaping the Equity Markets: A Guide for the 1990s, Harper Business, 1991 (reissued by Business One Irwin, 1993). He has served as a consultant to various market centers including the New York Stock Exchange, the American Stock Exchange, Nasdaq, the London Stock Exchange, Instinet, the Arizona Stock Exchange, Deutsche Boerse, and the Bolsa Mexicana. From April 1983 to April 1988, he was an associate editor of The Journal of Finance, and he is currently an associate editor of the Review of Quantitative Finance and Accounting, the Review of Pacific Basin Financial Markets and Policies, and The Journal of Entrepreneurial Finance & Business Ventures, and is a member of the advisory boards of International Finance and The Journal of Trading. In December 1995, Professor Schwartz was named the first chairman of Nasdaq's Economic Advisory Board, and he served on the EAB until Spring 1999. He is developer, with Bruce Weber, of the trading and market structure simulation, TraderEx (http://www.etraderex.com/).